Yiwu is a business city located just 50 minutes by high-speed train from Hangzhou. Almost everyone I’ve met here who does business in China has heard about Yiwu. No, it’s not particularly beautiful. Nor is it the site of some special festival or touristy place. Instead, it’s famous for its gigantic, sprawling markets. It’s even called “the ‘Wall Street’ for the counterfeiting industry,” whatever that means (Wikipedia). The foreigners who know about the city are the ones who do business there. If it weren’t for a classmate of mine who happens to be the daughter of Bulgarian toy importer, the place would have remained forever a mystery to me. When my classmate waxed poetic about the great jewelry, shoes, bags, and eastern European food, I could not abate my own curiosity. I was feeling frustrated with Hangzhou–its stuffy shopping malls and restaurants with identical menus. While waiting in line at the train station I received a sign from god that I was on the right track. 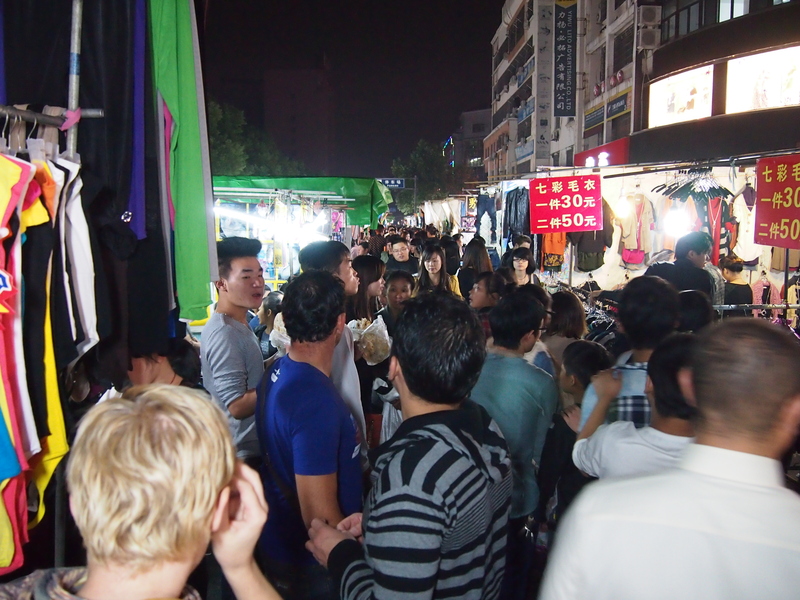 An Yiwu local heading home after the Mid-Autumn Festival holiday struck up a conversation. She explained that she worked for a distribution company. She asked us why we were visiting Yiwu. When I explained that we were going for the food and shopping she seemed surprised. Why would you go to Yiwu to go shopping? We like to come to Hangzhou to do that! I know it seems counter-intuitive but I’ve actually begun to play the opposite game when it comes to local advice about shopping. More often than not, people here have a very different preference for shopping and an opposite taste in clothing. People in Hangzhou seem to like paying extra to ensure that they get brand name items. This act of buying new and name brand, as explained recently by the guy behind the counter at a local technology market, is a point of pride. In the book, The Party, author Richard McGregor’s outline of a Chinese businessman Zhou Zhengyi offers a perfect example of the special kind of spending that occurs here in China. Here, the value of new, flashy, and expensive is illustrated through businessman Zhou and his gold bathroom, followed swiftly by his name brand home. But expensive purchases in China are not simply about being flashy. Many people claim that it’s often necessary to pay an exorbitant price to ensure that the item is actually genuine. A recent headline about an abandoned home in Wenzhou caught my attention and appeared to confirm the Chinese fear of counterfeit goods. The article explained that 10,000 bottles of one of the world’s most expensive wines, Chateau Lafite Rothschild, were discovered in an abandoned house. If real, the bottles would be worth a staggering $16 million. Of course, it’s probably not genuine. I was shocked to read that “70 percent of bottles of Chateau Lafite sold in China are not the real deal”. No wonder people are concerned about avoiding counterfeit! The tough part comes when you pair the interest in purchasing the real deal with a serious lack of exposure to the real deal. People prefer to buy overpriced and over-bedecked clothes with name brands like “Jason Wood”, which they explain are ‘very famous’. But when they talk about these clothes, I can’t help but think of the real Jason Wood (Jason Wu) and all of the other Western brands that have Chinese counterparts that don’t remotely resemble the original. I see funny copycat brands all over, and everyone buys them here, not just women. Tsing Tao-bellied dads stroll down the street in Armone Excannge T-shirts and Vrasache fanny packs. Women of all types cling to pleather Louise Vuitton bags. Most retailers don’t seem to mind that their products are so clearly cut from a different cloth, nor do they exhibit any shame in their copyright infringement. Chinese entrepreneurs actually believe that naming their store H&L and printing a storefront sign in the same font as the multinational Swedish original will attract customers, and I suppose it does—just not western ones. In the end, Yiwu turned out to have a lot of the same stuff that you find everywhere else. There were the same sales women in the markets assuring me that the polyester Burberry knockoff scarves were silk and the cotton dresses were cashmere. But it was fascinating to see a place that served as the epicenter for so much livelihood—so much commerce and haggling and deceit and bargain hunting and mass production. By then end of the weekend I had managed to settle on a nice down jacket for winter and a handful of socks. Later, when I returned home and returned to my computer, I was humorously struck with how well my experience seemed to fall in line with the identity of the city, despite my feeling of barely touching the surface. When I read on Wikipedia that Yiwu apparently produces over 3 billion pairs of socks a year to be shipped worldwide, I couldn’t help but think about my own humble purchase. In a pathetic and strangely nostalgic way I felt as though I’d played a role in that city, without even realizing it. I was there. I bore witness to that place–I bought socks.